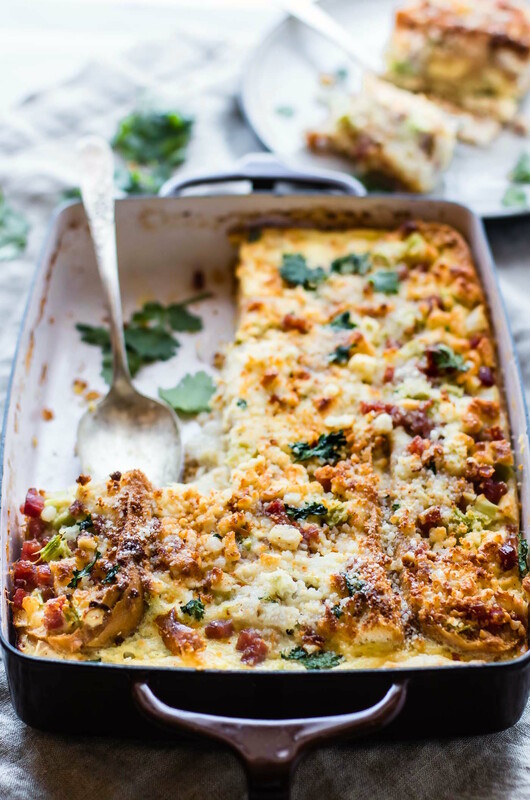 Breakfast strata is a baked eggs casserole that’s easy to make and will please everyone! Yes, it does exist! A breakfast casserole you can make ahead, or bake in 30 minutes. Layers of breakfast staples like eggs, gluten free French bread, ham, veggies, and more. An easy gluten free brunch recipe for the holidays! 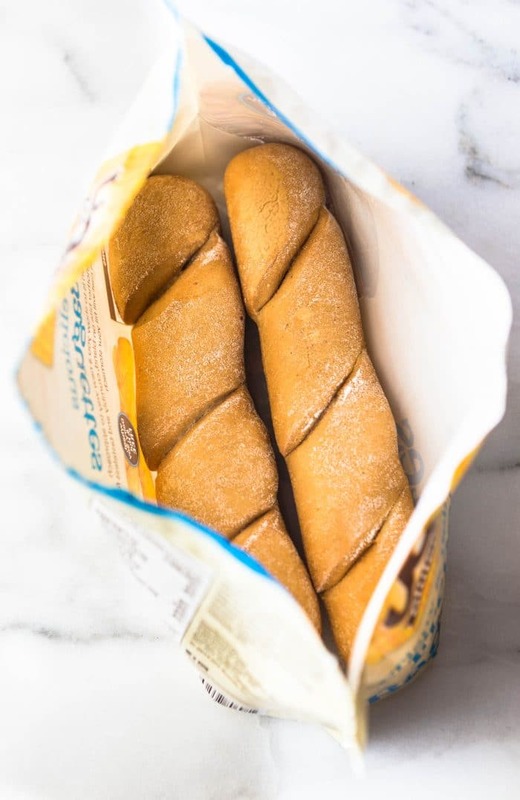 Thanks to Udis Gluten Free for such awesome GLUTEN FREE French bread and for partnering with Cotter Crunch on this gluten free awareness recipe. So Thanksgiving is in a month. Um… the holidays are so upon us! EEK! I kinda geek out. You know me, those FALL flavors gives me warm fuzzies. Hence the “glow“. But the holidays, well they bring something even more important to the table. Yes, COMFORT food! Like home cooking, slow weekend, brunch food, and homemade bread kind of comfort. 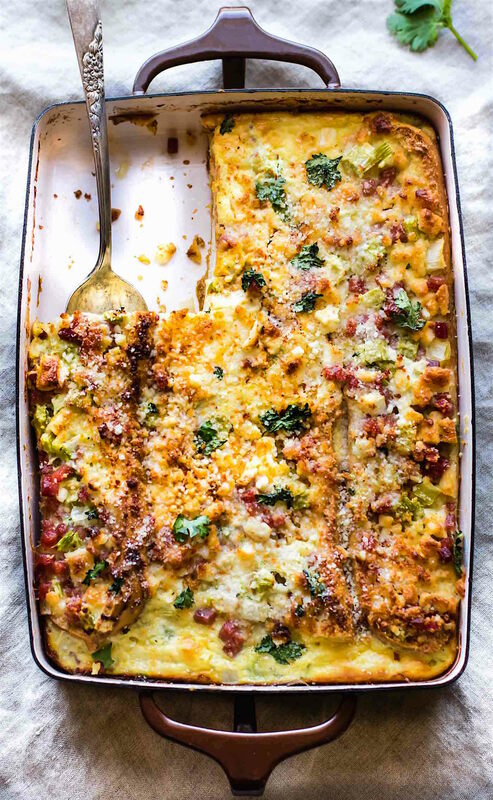 Maybe in the form of, say…gluten free french bread ham breakfast strata? Oh yes, that comfort. I know what you’re thinking. How does brunch food relate to upcoming holidays? Isn’t more about the turkey, ham, and pie? Well yes, but that’s not comfort to me. That’s just tradition! Both are lovely. Comfort means the chance to welcome and comfort others; friends and family. And since food is love, that’s my”comforting” gift. I’ll get to the gluten free french bread breakfast strata in a minute, so stay with me here. Wipe the drool and refocus, mmm k? I’ll create an example of this holiday comfort for you. Have you ever smelled a loaf of fresh rolls or biscuits being pulled out of the oven? The aroma alone is peaceful and so inviting. Unless of course you are gluten free or new to gluten free. Then it’s torture! The coveting of glutenous carbs… sigh. But this is where my comfort food MOJO comes into play ya’ll! Being able to provide that gluten free or allergy friendly option for those who have gluten intolerances or are just starting to explore gluten free living. I strive (with passion) to be that encourager, that provider, that go to resource for everyone wanting embrace a healthier, gluten free lifestyle. Whether it be by choice or by necessity. This is why I think holidays are about comfort, not just in food, but in the way we act towards each other. When it comes down to it, it’s about showing compassion, kindness, and warmth. Now…. speaking of warmth. 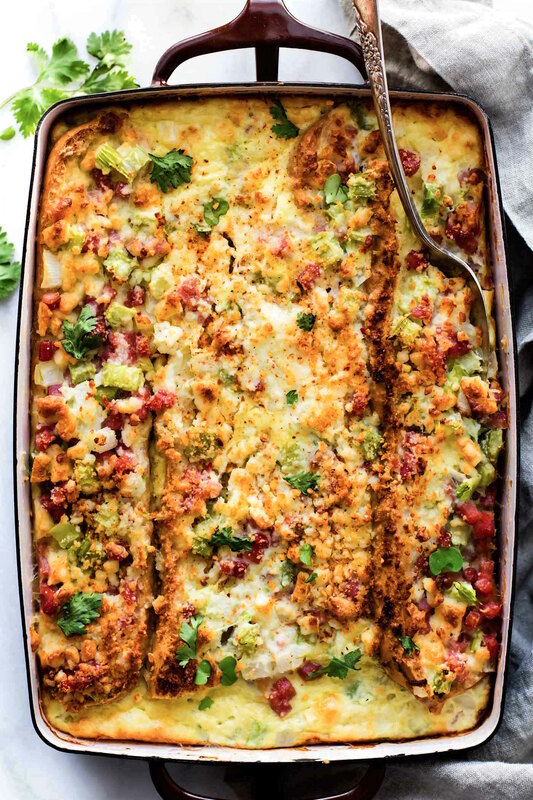 Let’s talk about this gluten free french bread ham breakfast strata, because it’s gonna warm your soul! When guests come into town, make a strata or any gluten free casserole for that matter. To me, casseroles are sign of hospitality. Are the people you’re feeding trying a new gluten free lifestyle or diagnosed with gluten sensitivity or celiac disease? NO PROB! You can be their safe place, their comfort. Bust out the butter (grass fed if you really want to impress) and Udis gluten free French bread (soy free, dairy free). 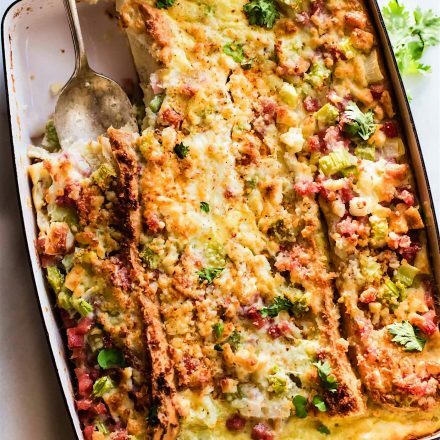 This gluten free french bread ham breakfast strata recipe is an easy make ahead casserole to have on file for those very comforting “hospitable” moments It’s also a great use of holiday leftovers (like that honey baked ham) and it’s SUPER quick to make. Here’s what you need. It’s quite simple! And OH SO CRUSTY Gluten Free French Bread. prepare your French bread and place it and the veggies in a dish. Cover it and place in fridge. Make your egg/cheese batter and keep that separate. Place in fridge until ready to cook. Pour over the french bread and ham/veggie mix. Then bake it up in 30 minutes. A 30 minute recipe! Like whoa…. AMAZING fast! 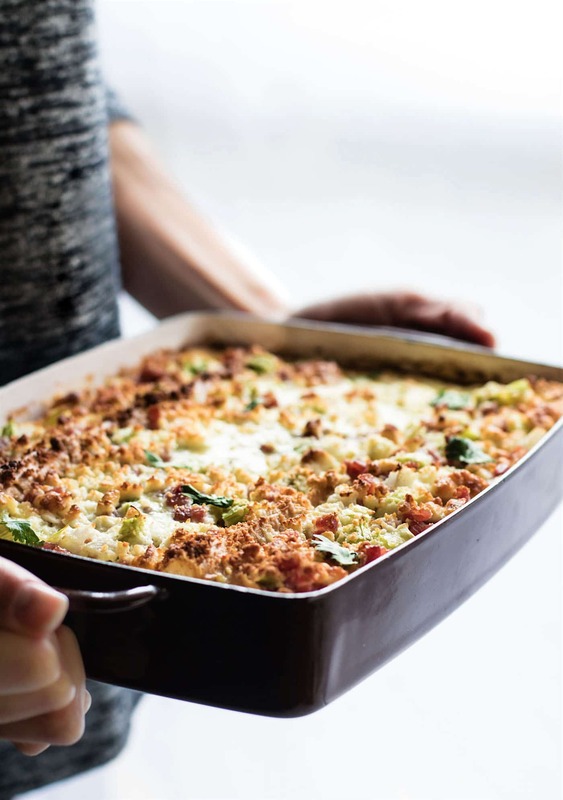 Check out this wicked fast French bread breakfast strata recipe, ya’ll! This Gluten Free French Bread Breakfast Strata recipe is easy-to-follow and can be made ahead! 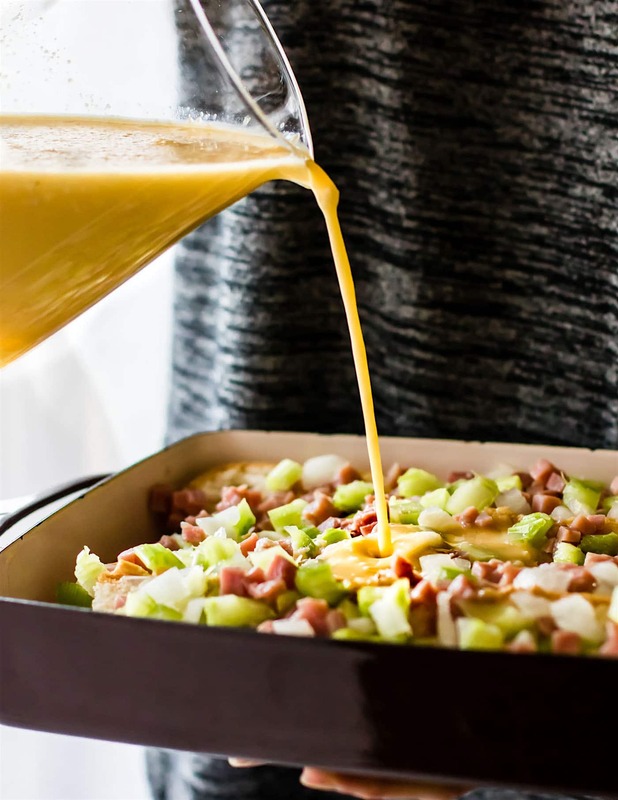 A quick breakfast casserole with ham, perfect for brunch. 1 1/3 cup or about 7-8oz of diced ham (nitrate free). Leftover Holiday ham works great. Preheat oven 425F. Grease or oil down a casserole dish. 9×3 or 8×10 work. Spread the garlic and butter evenly on all four slices. Place bread slices lined up with each other in the casserole dish. Next prepare you egg batter. Whisk together the egg, milk, egg white, salt, pepper, and parmesan. Set aside. Sprinkle your ham, celery, and onion evenly over the gluten free french bread. If you are making all at once, then you will pour the egg parmesan batter evenly over the bread, veggies, and ham. Don’t worry, you will have some bread crust ends sticking out above the batter if you have a smaller dish. Spread the feta crumbles on top and any extra parmesan you’d like to make more cheesy. Place in oven for 25-30 minutes or until bread is crusty/golden brown and eggs are cooked. Baking times will vary depending on the thickness of you french bread and your oven. Check at 25 minutes to be safe. Once you know it’s cooked, remove from oven. Garnish with red pepper flakes and fresh herbs before serving. If you are making this ahead. Prepare your french bread and place veggies in dish. Cover and place in fridge. Make your egg/cheese batter and keep that separate. Place in fridge until ready to pour over bread and bake. Be sure to whisk egg batter again before pouring. Any veggies will work but onion makes it more flavorful. Baking times will vary depending on the thickness of you french bread and your oven. Check at 25 -30 minutes. Nutrition shown below is based on using Udi’s gluten free French bread. Oh, I almost forgot the best part. You don’t even have to wait for this gluten free french bread to be a day old in order to use it in a breakfast strata. Yes, that’s usually what a true strata recipe will call for, but Udis gluten free french bread does wonders and bakes up nice and crusty! 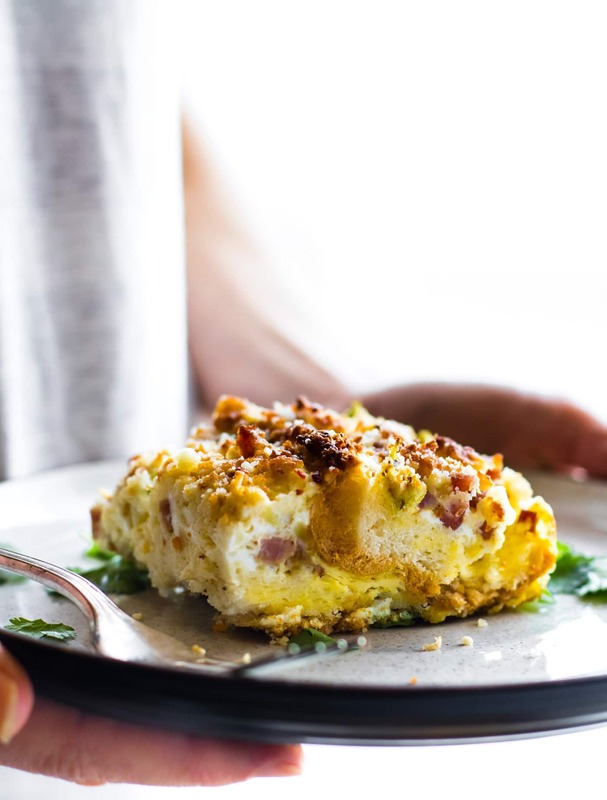 A Ham Breakfast strata that will please everyone (gluten free or not) and feed a crowd. See, you’re gaining holiday hosting bonus points already, and with ease. My heart is full! I mean, it’s full of gluten free “healthified” comfort food at it’s finest. P.S my husband has never had a real breakfast strata, let alone gluten free breakfast strata. In New Zealand, the holidays are in the Summer. Christmas BBQ Burgers are a real thing! Haha! Needless to say, I love making a new holiday-ish recipes for him to try. And guess what? He loves this breakfast casserole! The way to a man’s heart is through is stomach, right? that’s probably true for everyone though. Cheers to comfort, gluten free breakfast made easy, and the start of HOLIDAY season! What’s your favorite comfort food to make for others during the Holidays? Have you ever tried Gluten Free French bread or used french bread in a strata? what’s her recipe? I’d love to know! For me holidays are more about the breakfast food than the dinner. I know crazy but I love a good comforting holiday breakfast. I’ve never made or had a strata before. Always a first for everything! There’s just something about a delicious, comforting holiday breakfast to get the festivities going, right?! Yes, always a first and I really hope you try this strata! Let me know if you do! We love breakfast for dinner, so I’m totally making this when I have some leftover holiday ham. Great idea, and beautiful photos, as always! Mmm, breakfast for dinner needs to happen at least once a week…haha!! Can’t wait to hear what you think after you make this! Thanks, Blair! I love a good strata. They’re great for feeding a crowd too; so much comfort in that casserole dish. It’s awesome Udi’s has a bread that allows people with gluten issues to still enjoy strata. right? I love that they put so much care into helping other with celiac too! this is why we need to live closer. Or in New Zealand. ASAP! I can’t believe this can be made in 30 minutes! 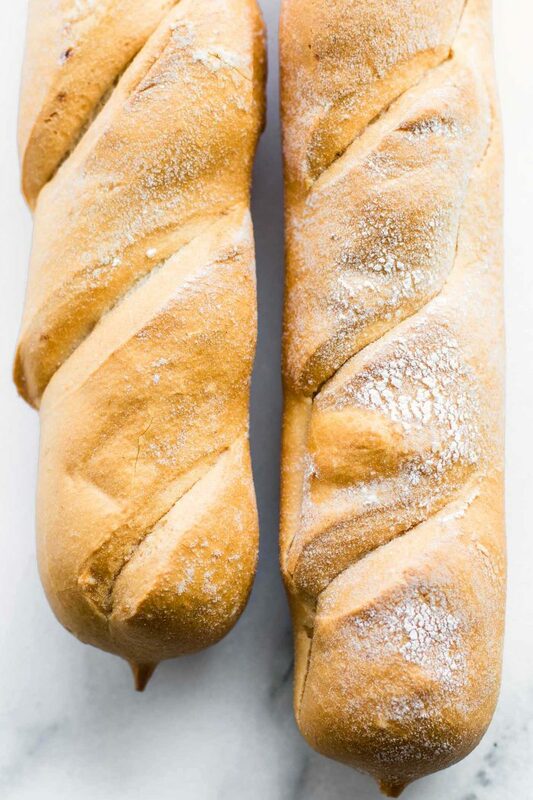 And I need to try this french bread! for sure! let me know if you do Maria! 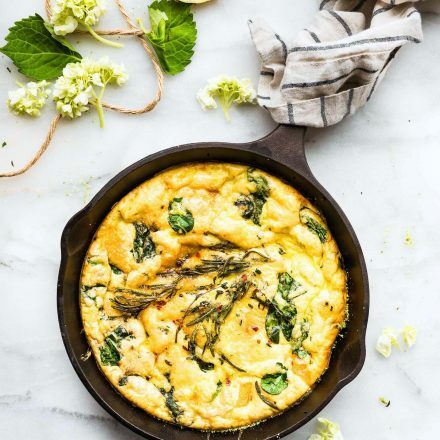 I’m just getting into egg dishes, and need to add a strata to my list. This looks amazing! You’re going to love it! Thanks, Alisa! 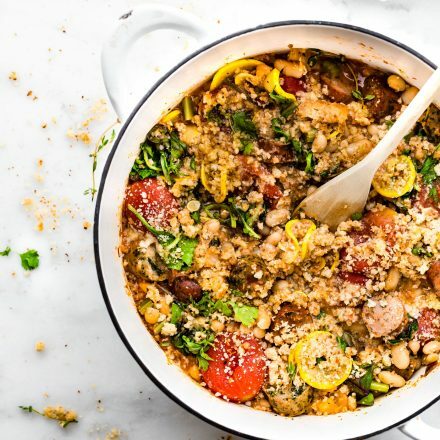 Yes, Udi’s French bread is so delicious and you’ll love it in this breakfast strata! 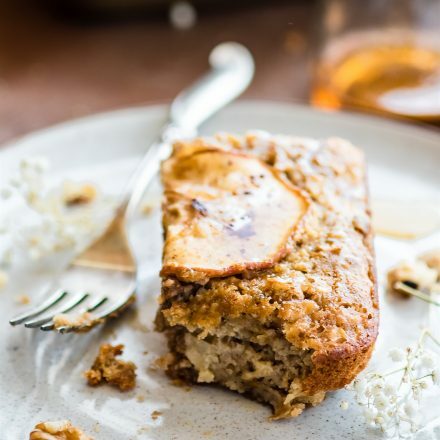 This looks like the perfect breakfast to bake up on Christmas morning and eat in your slippers by the tree while the kids open presents….love it! Absolutely! Hope that’s exactly what you do! Thanks, Laura! Gluten free healthified comfort food is the best kind of food!! I’ve never had a strata before but this sounds awesome!! Yes, it sure it! Hope you try this! Would love hear if you do! Haha!! That would be nice for sure! We always do a breakfast casserole for Christmas morning. I need to remember about this one. Love that i could prep the night before and cook it while we are opening gifts. right? i kinda love all the crusty goodness! so easy! oh yes, thanks! I meant to say lay length wise across the casserole dish. LOL! Will fix. Hi! I’m planning to make this Christmas morning. I couldn’t find a ham without nitrates ?. Do you think bacon would be ok ito substitute in this? Thanks! You can certainly use a ham with nitrates, although it’s not the greatest for you. At one time or another won’t hurt. You could also use Canadian bacon or I’m sure Bacon would work as well. You just might have to cook it a little before putting it in a strata. You could even use a turkey or chicken sausage. Let me know how it goes. Have a wonderful Christmas. !